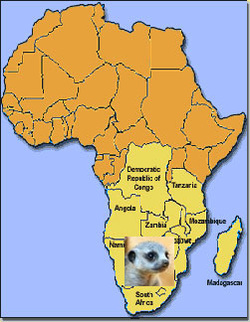 The meerkat lives in the Kalahari Desert in Africa. They spend a lot of time digging in the sand for their food and to make sure sand doesn't get in their ears while they dig, they have special flaps that cover their ear. Meerkats enjoy a variety of things to eat, like insects, spiders, millipedes, centipedes, scorpions, eggs, plants, snakes, lizards, small mammals, roots and bulbs. Most animals can't eat poison bugs but the meerkat can eat all types of poisonous creatures from snakes to scorpions. Meerkats were made famous in the movie, The Lion King. Remember Timon? You can get an idea of their body by looking at his. They are small, furry animals that only get as long as a ruler! (12 inches). They have a long body and long sturdy tail that helps them balance when they stand. Meerkats have a lot of enemies like Cobras, martial eagles, falcons, hawks and jackals. They have a special meerkats that watch the sky and land for anything that may attack them. When they feel safe, you can find them basking in warmth of the sun. 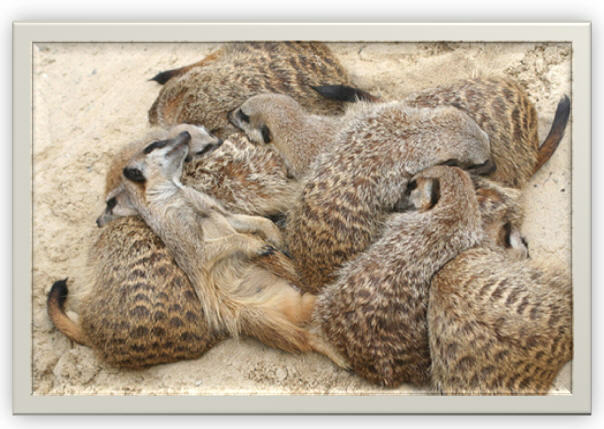 Meerkats live in large groups called mobs or clans. They do everything together, from eating, playing and working. Everyone in the clan has a job to do. After a long day, the meerkat goes to its underground den for a good night sleep.